May 7, 1922 – March 14, 2014 It is with saddened hearts that we announce the unexpected passing of our dear mother, Rosario Mora on Friday, March 14, 2014. She passed away peacefully and surrounded by her family. Rosario left us to join her husband, Fernando Mora, who predeceased her on August 22, 1973. She was also predeceased by her parents, Ramon and Carmen, siblings, Alfredo and Aurora, and daughter-in-law, Ginita. Rosario will be missed by the many lives she touched with her kindness and beautiful smile. She is survived by her children: Fernando and Lita Mora, Leonardo and Marlene Mora, Mariana and Dan Zaretski, Ines Mora, Beatriz and Fernando Russo, Martha and Fernando Jativa, Maria Sol and German Martinez, Cecilia and Cesar Fernandez and Rosario and Jorge Fernandez. She also leaves to mourn her grandchildren, Fernando (Deepa), Daniel (Anna), Patty (Tony), Leonardo, Veronica, Jonathan, Steven, Sebastian, Miguel (Fernanda), Daniela, Monica, David, Alejandro (Cristina), Renato, Stephany, Pamela, Michelle, and Andrea, and 11 great-grandchildren. Rosario is also survived by her siblings Alicia, Carlos and Judith, and Leonardo and Rosita, as well as many nieces and nephews. Rosario was born and raised in Ecuador and moved to Canada 30 years ago to be reunited with her children and to help raise most of her grandchildren. She was a woman of deep faith whose life was grounded in prayer. Mom left us with many loving memories that will live forever in our hearts, invaluable life lessons, and most of all, she taught us family values that will guide us every step ahead. The Mass of the Resurrection will be celebrated on Thursday, March 20 at 1:30 p.m. at St. Ignatius Church, 255 Stafford Street, with Rev. Fr. Darrin J. G. Gurr presiding. A reception will follow in the parish hall. 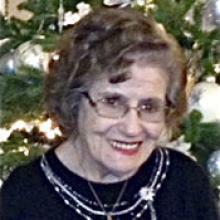 In lieu of flowers, memorial donations may be made to St. Gianna’s Church building fund or the MS Society of Manitoba. The family expresses their gratitude to relatives and friends for their support during this difficult time.